Multnomah Falls, Columbia River Gorge. 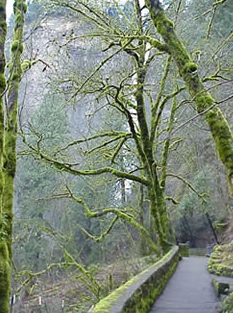 This forest that is always wet from the mist of the falls in the background is a perfect environment for mold — nature's recycler. There are 4 critical requirements for mold growth – available mold spores, available mold food, appropriate temperatures and considerable moisture. The removal of any one of these items will prohibit mold growth. Let's examine each requirement, one-by-one. Magnified sporangiophore of the Pilobolus — "the shotgun fungus." The small dark knobs at the top of each stalk contain the spore sacks that are "shot" up to 6 feet into the air toward the sunlight by this unique fungus. Mold Spores. Ranging in size from 3 to 40 microns (human hair is 100-150 microns), mold spores are ubiquitous – they are literally everywhere. There is no reasonable, reliable and cost-effective means of eliminating them from environments that humans inhabit. So, trying to control mold growth through the elimination of mold spores is not feasible. Mold Food. If all three other requirements are met, almost any substance that contains carbon atoms (organic substance) will provide sufficient nutrients to support mold growth. Even the oil from your skin that is left when you touch an otherwise unsuitable surface, like stainless steel, or the soap residue left from a good cleaning will provide sufficient nutrients to support the growth of some molds. And many of the most common materials found in homes like wood, paper and organic fibers are among the most preferred of mold nutrients. Thus, eliminating mold food from your environment is a virtually impossible task. Appropriate Temperatures. Unfortunately, most molds grow very well at the same temperatures that humans prefer. In addition, anyone who has cleaned out their refrigerator quickly realizes that temperatures close to freezing are not cold enough to prevent mold growth and temperatures that are much warmer than humans prefer, like those of the tropics, will grow abundant quantities of mold. Therefore, it is not feasible to control mold growth in our home environment through the control of temperature. Considerable Moisture. Most molds requires the presence of considerable moisture for growth. Obviously, the word "considerable" is key here. The mycologists (fungi scientists) refer to "water activity" when describing the required conditions for mold growth. The various species of mold have different water activity requirements. A material's "water activity" is equivalent to the relative humidity of the air that would be in equilibrium with the material at that material moisture content. The vast majority of mold species require "water activity" levels that are equivalent to material equilibrium moisture contents corresponding to relative humidities of at least 70%. In fact, the great majority of serious, large mold outbreaks inside buildings occur where porous, cellulose-type materials have literally been kept wet by liquid water or sustained condensation. Human beings prefer humidities that are below the critical relative humidity for mold growth. Thus, of the four basic requirements for mold growth, moisture availability is by far the easiest mold growth requirement to control in environments that humans like to inhabit. As you will see from the remainder of this guide, and from the vast majority of the literature on mold control, the consensus regarding effective mold control strategies consists of the combination of reducing the availability of moisture and killing and removing active mold growth colonies. Note the pink "splotch" at the bottom-center of this photo. It is the telltale warning sign that there is a likely mold "bloom" behind the vinyl wall covering. Although most active mold colonies appear greenish to black (typical of mold growing on bathroom tile grout) in color, the characteristics of mold colonies growing behind vinyl wall covering in buildings takes on very different characteristics. These mold outbreaks typically result in pinkish to yellowish staining of the wall covering. They are quite important because they indicate serious, detrimental moisture accumulations within the gypsum wallboard behind the wall covering that can not be removed by your air conditioning or dehumidification systems. Where these problems appear, they usually require the assistance of a professional equipped with pressure measurement and other diagnostic equipment to determine the source(s) of the moisture causing the problem. The following practices will help minimize the growth of molds inside homes located in hot, humid climates like Florida's. Mold growth on the outside of homes is not covered here and readers are cautioned that these practices may not be applicable in other climates. Air Conditioner Operation: Always set the fan mode switch of your air conditioner thermostat in the AUTO position, never in the ON position. Why? When set to the ON position the blower fan runs continuously and the moisture which has condensed on your air conditioner's evaporator coil during cooling is re-evaporated and blown back into your home before it can drain off the coil and out of your home. This causes the relative humidity in your home to be significantly greater than if the air conditioner thermostat fan mode switch is set to the AUTO position. Even in the "auto" position, some air conditioners run the blower for 1-3 minutes after the compressor shuts off. To maximize dehumidification, it is best to disable this feature. A qualified mechanical contractor should be able to disable this feature so that the blower and compressor turn off simultaneously. Air Conditioner Selection: If you are building a new home and can choose, then choose an air conditioning system with a variable speed air handler and an operating selection mode for "enhanced moisture removal." This is a good option for multiple reasons: the units are SEER 14+, they are quiet and they do a better job removing moisture, particularly under part load conditions. They accomplish this by starting the air handler fan at a lower speed during each cycle, which improves moisture removal. The variable speed fan motors are intrinsically more energy efficient-- they use as little as 270 W/1000 cfm of air flow as compared with the typical 450 W/1000 cfm. Each of the major manufacturers have them. When used properly, they are ideal for Florida's climate. * AC operated alternatively for at least one week in each mode. Interior Doors: Interior doors should be kept open when air conditioning unless your heating and cooling system has a fully ducted return air system from each room of the home or unless specific and sufficient return air transfer pathways have been installed to ensure that closed interior doors do not result in space depressurization problems in the home. Space Pressurization: It is important that homes in hot, humid climates be pressurized slightly with respect to outdoors. The reason is fairly straightforward but not very obvious. If homes are depressurized with respect to the outdoors, then hot, humid outdoor air will be pulled through the very small air pathways that exist in all building envelopes (walls, ceilings, floors, etc.). To get from the outside of the home to the inside, this air often must follow circuitous pathways. For example, the air may enter the wall system high on the exterior where an outdoor light fixture is mounted and exit the wall system low on the indoors where an electrical outlet is located. If the home is air conditioned, the gypsum wallboard will be relatively cold — often colder than the dewpoint temperature of the humid outdoor air that must flow along that gypsum wallboard to that indoor electrical outlet. In Florida, it is not uncommon for summertime outdoor air dewpoint temperatures to be greater than 80 F! When this occurs, the colder gypsum wallboard can act just like that ice tea glass that "sweats" like crazy when you take it outdoors — it can condense the moisture out of the air that is flowing along its back surface on its way to the electrical outlet that is serving as its pathway into the air conditioned home. As illustrated in the figure below, this can result in moisture accumulation within the wallboard, which, in turn, can result in significant mold growth. The above wall diagrams from detailed computer simulations that model the combined impacts of heat, moisture and air transport (3) illustrate the importance of this air flow phenomena. The wall on the left bounds a space that is pressurized with respect to the outdoors and the one on the right bounds a space that is depressurized. The 2 Pa (Pascal) pressure gradient is very, very small — there are 101,325 Pa in one atmosphere. Clearly, it is the direction of the pressure gradient rather than its magnitude that is critically important here. You very much want your home slightly overpressurized in hot, humid climates so that dry, cool indoor air is pushed out of the home through the walls (figure on left) rather than have hot, humid outdoor air sucked into the home through the walls (figure on right). Fortunately, it is relatively easy to pressurize a home — all that is necessary is that slightly more air be brought into the home than is exhausted. This normally requires a positive mechanical ventilation system. Ceiling Fans: Use ceiling fans in the summer — they allow you to be comfortable at higher air conditioning thermostat temperatures. And they will save air conditioning energy costs if you use the most efficient ones (see Gossamer Wind® Series - available at Home Depot stores) and turn them off when no one is in the room. Measure the RH in Your Home: Invest in a digital temperature and relative humidity (RH) sensor (about $20) and observe your indoor relative humidities. Two sources for these sensors are Radio Shack and Therma-Stor Products (1-800-533-7533). During the hot summer months, with the air conditioning on, the RH should not exceed 55% during the day on a regular basis. If it does, you probably have problems either with leaks in your duct system or with your air conditioner unit itself – it could be too large, improperly charged or have insufficient air flow across the coil. Consult with a qualified air conditioning expert or mechanical engineer to determine the problem. The highest relative humidities in your home are likely to occur during mild weather when your air conditioner is not needed during the day. In Florida, the outdoor relative humidity reaches very near 100% on most nights, regardless of daytime temperatures. If your home is open to the outdoors during these periods, the materials in your home will adsorb moisture from this very humid air, again regardless of the temperature. If this moisture is not removed during the following day, the "water activity" of the materials in your home can stay at or above 75% for extended periods and mold is likely to grow on these surfaces. If you have RH levels exceeding 70-75% for extended periods, and find it difficult to control mold growth on surfaces in your home in spring, fall and winter, you may need to invest in some type of dehumidification system and should consult with a qualified mechanical system expert for advice. Vinyl Wall Covering: Impermeable interior surfaces like vinyl wall coverings can result in severe mold problems in hot humid climates such as Florida's. Moisture coming from outdoors can accumulate within the gypsum wallboard that is behind the vinyl wall covering. 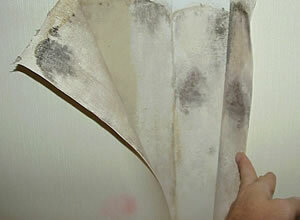 This normally occurs as a result of house depressurization where outdoor air is being sucked into the home through the very minute air pathways that exist in all normal wall systems. Where this problem occurs, outbreaks of mold often occur beneath the wall covering on the surface of the gypsum wallboard. This mold growth is normally characterized by pinkish to yellowish "splotches" on the vinyl wall covering. The moisture accumulation also can be severe enough to cause the gypsum wallboard to badly deteriorate and become "mushy." If you have noticed these symptoms, a building science professional should be consulted. Positive pressurization of your home is one method of minimizing the potential occurrence of this problem. Return Air Pathways: It is important that there be sufficient air flow pathways for the supply air that is delivered to each room of a home to return to the air conditioner's air handler unit (the box with the blower fan). Otherwise, the part of the home containing the main return to the air handler unit will be "starved" for air, resulting in depressurization of this space with respect to the outdoors. If this occurs, outdoor air will be drawn through the small pathways that exist in the exterior building envelope. In hot, humid climates like Florida's, these air flows can result in the accumulation of moisture within the gypsum wallboard, especially if it has vinyl wall covering. This, in turn, can result in the rapid and abundant growth of molds — remember, the cellulose (paper) on gypsum wallboard makes an excellent, preferred mold food. If room doors are kept open, there will be sufficient return air pathways. However, if rooms doors are closed, the rule-of-thumb is that there should be about 50 square inches of "free" air transfer area for each 100 cfm (cubic feet per minute) of supply air to the room. In this case, the term "free" means a simple, clear hole in the wall between the room and the remainder of the home. If, for appearance and privacy reasons, this hole is to be covered by grilles on each side of the wall, then the overall return air pathway area needs to be increased by about 40% to account for the air flow resistance of the grilles, or about 70 square inches per 100 cfm of supply air flow. Whole-House Ventilation Fans — Opened Windows: Avoid the use of these fans when it is humid outdoors, especially if you have noticed mold growth in your home or you are having trouble controlling the relative humidity in your home. In addition, avoid opening windows for long periods when it is humid outside (e.g. during nights and evenings) if you are experiencing mold growth problems in your home. Air Conditioner Maintenance: Change your filters regularly and use pleated filters. Once a year get your air-conditioners professionally serviced. At that time make sure coils are clean, the condensate drains properly and that the drain pan has no mold. Water Damage: Water damage from flooding or other major water intrusion in homes should be dried within 24 hours if at all possible. For severe flooding and severe water damage for more than 48 hours, a trained restoration professional should be consulted regarding cleanup procedures. Readers are also encouraged to consult the American Red Cross web site at the bottom of this page for further information. Moisture Condensation: Single-pane, metal windows, which are common in Florida, generally condense water on the inside in winter. It is good practice to remove this condensation before it can run off and be absorbed by porous materials like wood casing or gypsum wallboard. Condensation can also occur on other surfaces in homes. If condensation is noticed on interior surfaces in summer, it may indicate a number of problems, including inability to control indoor humidity; air conditioner supply registers aimed directly at interior surfaces; duct leakage problems and pressure imbalances; or all of the above. If you notice indoor surface condensation during summer, you should contact a professional to help diagnose the cause. However, during early spring when the ground is still cool, it is quite possible to experience some condensation on tile floors on slab-on-grade homes that are open to the outdoors. This should not be a regular occurrence, but only something that occurs rarely. Exhaust Fans: Make sure the clothes dryer vent goes all the way to the outside of the home, not to the crawlspace or to the inside of the attic or the house. The same goes for bathroom vent fans. It is also important for the kitchen range hood to vent to the exterior as well. Recirculating stove and kitchen vents provide no removal of stovetop moisture and inferior control of cooking related pollutants compared with venting completely to the outdoors. A major deterrent to the use of kitchen range hoods is noise. Choose an ultra-quiet, inline ventilation fan for your range hood. Kitchen and bath exhaust fans should only be used while cooking or using the bathroom to remove excess moisture generated by these activities. It is best practice to either have bathroom vent fans interlocked with the light switch so they do not get left on or have them switched by a manual timer that will shut them off after a period of time, or control them by humidistat. House Plants: Minimize live house plants, especially if you have any trouble controlling the relative humidity in your home. 1) Place a dehumidifier on a timer in the home so that it runs for 3-4 hours per day. Often it is best to drain the condensate from the dehumidifier to a sink. Leave the AC system set off with this strategy, although ceiling fans on low speed might be set to circulate the air in rooms. Doors to rooms should be left open. 2) Using a programmable thermostat, set the air conditioner to 74 F from 3-6 AM. This operates the cooling system constantly during the early morning hours when indoor coil temperatures will be achieved resulting in good moisture removal. Set up the thermostat to 85 F during the rest of the day. This appears to work well in a majority of homes and under a wide range of weather conditions, although any significant duct leakage must be repaired. The authors of this web page are Philip Fairey, Subrato Chandra and Neil Moyer of the Florida Solar Energy Center. 1. Readers are cautioned that there is not full consensus among the medical and health science community on the potential health consequences of exposure to molds. Individuals with compromised immune systems, allergies, asthma, other lung diseases or other medical problems should consult their physician before physically contacting or disturbing any mold growths. 2. M.K. Khattar, M.V. 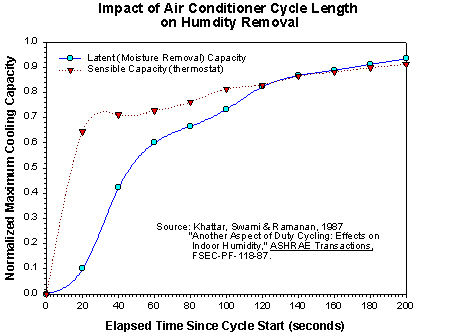 Swami and N. Ramanan, "Another Aspect of Duty Cycling: Effects on Indoor Humidity," FSEC-PF-118-87, ASHRAE, 1987. 3. Swami, M.S., Lixing Gu and Philip Fairey, 2001. Appendix K, Moisture Analysis and Condensation Control in Building Envelopes, Heinz R. Trechsel, Ed., pp.183-184, ASTM Stock No. MNL40, ASTM International, West Conshohocken, PA.